The original dirty brawler concludes with Robots, Clones and Kangaroos! Help Axel, Blaze, Skate, and Dr. Zan put an end to Mr. X once and for all. After tasting defeat at the hands of our heroes, Mr. X has returned with an all-new plot to rule the city from the shadows. Using a new company as a front, Mr. X has brought in the world’s premier roboticist to create an army of clones to replace the city’s top officials. Now, it’s up to you and your friends to take to battle your way through the distractions set up by The Syndicate and stop Mr. X once and for all. Take out Mr. X’s Syndicate with upgradable special moves, combination attacks, and an arsenal of weaponry! Your actions and play style determine which of four unique endings you see! 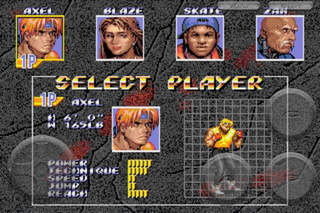 In addition to your four heroes, play as Streets of Rage 2’s Shiva or a kangaroo! Beat up Mr. X’s thugs alongside a friend with Bluetooth Peer-to-Peer Multiplayer (Bluetooth required – available only for 3rd generation iPhone & iPod touch and 3.x OS or better)!